State defence acquisition agency Armscor has placed an order for three inshore patrol vessels (IPVs) from Damen Shipyards Cape Town (DSCT) under the SA Navy’s Project Biro. The project will run for six years. In announcing the long-anticipated order on 26 February, DSCT said it will supply three 62×11 metre vessels and released pictures of a Stan Patrol 6211. This model has a maximum speed of 26.5 knots, a range of 4 000 nautical miles, and a crew of up to 62. The SA Navy’s new IPVs will feature the Sea Axe hull – the straight-edged, axe-shaped bow cuts through the water, minimising slamming for improved safety and comfort on board and significantly reduced fuel consumption and emissions. The IPVs will be the first vessels of a Damen Sea Axe design to operate in South Africa. DSCT told defenceWeb that the vessels will be powered by four Caterpillar 3512C HD/B engines delivering 5 700 kW (7 644) hp and driving four fixed pitch propellers. They will also each have two stabilisers and two bow thrusters. Combat equipment will include a combat management system, radar, forward gun position and heavy machinegun positions. The vessels will each carry one 7 metre long RHIB and one 9 metre long RHIB for boarding operations. Container fittings on the aft deck will be available for fastening on mission equipment. Various layouts are accommodated including one 20 foot and four 10 foot containers. Deck layout will include a knuckle boom crane, single point lifting davit rated at 5.7 tons and a single point lifting davit rated at 2 tons. DSCT said it received the IPV order exactly four years to the day that it received the order to deliver vessels for a previous project for the South African Navy – Project Canter (it supplied two tugs). DSCT Chairman Sam Montsi said the yard is delighted to be able to continue to provide support to the navy. The project aims to develop South Africa’s maritime security, ensuring that the country has the capability to respond effectively, rapidly and cost-efficiently to maritime threats such as illegal trafficking and fishing. Participating in Project Biro underlines Damen’s commitment to the South African Government’s Operation Phakisa initiative, which aims to unlock the potential of the country’s maritime industry. DSCT said it will source components and services from South Africa-based suppliers, especially small and micro-businesses, and contribute to the National Industrial Participation (NIP) programme and the complimentary, defence-focused Defence Industrial Participation (DIP). 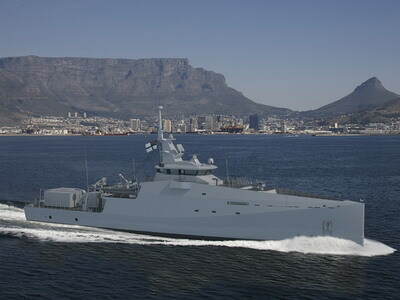 The SA Navy was looking to acquire three inshore and three offshore patrol vessels under Project Biro, but after selecting DSCT as the preferred bidder in February last year, the offshore patrol component request for offer was subsequently cancelled. This is likely due to the shrinking defence budget, which is R47.9 billion for 2018/19 compared to R48.9 billion allocated for the 2017/18 financial year. Armscor recently confirmed that it has awarded Project Hotel, for a new hydrographic survey ship for the SA Navy, to Durban-based Southern African Shipyards (SAS).